"I have always preferred to paint angels as beautiful winged women. 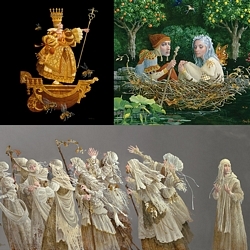 I strongly feel that the feminine side of human nature communicates angelic qualities- peace, encouragement, support and unconditional love-in many ways, that which we get from our mothers," explains James Christensen. "And then there are faeries. These social yet mischievous creatures commonly make fleeting and momentary promises. Some have the attention span of a newt, and I have it on good authority, and neatness may not be their forte either. Given all that, it's not so hard to imagine a social structure upon which relationships between them could be based." While "Angel with Two Faeries" may be a wonderful companion piece to "Angel," this colorful and decorative Fine Art Giclee Canvas will hang resplendently by itself. Hurry and order yours before this piece of magic disappears.